Maristela Salvatori has a degree in Fine Art from the Universidade Federal do Rio Grande do Sul, where she teaches on the undergraduate and Postgraduate Visual Arts Programme and coordinates research into O Fasc°nio do Traáo (The charm of the Line). Now living at Quebec City as invited researcher of the Laval University, she works with issues related to printmaking and photography. 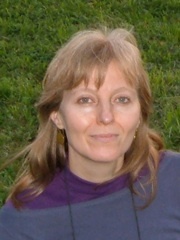 She is a co-author of the book Mestiáagens na Arte ContemporÉnea (organized by Icleia Cattani, Porto Alegre: UFRGS, 2007). She lived in Paris for four years, taking a doctorate in Fine Art, at UniversitÇ de Paris I, and living for two years in studio-accommodation at the CitÇ Internationale des Arts. She has participated in artist's residencies at Frans Masereel Centrum, Belgium (between 1998 and 2005). She has won awards in Paris, Recife, Ribeirto Preto, Porto Alegre and Curitiba, including GRAV'X 1999 in Paris. Her solo shows at galleries and museums in France, Mexico and Brazil, include Galerie Michäle Broutta, Paris, 2000, Galeria Iberà Camargo, Porto Alegre, 2004. Group exhibitions in Brazil and abroad include Points of Contact, Triangle Space, Chelsea College of Art & Design, London, 2009. Her work focuses on empty spaces, large planes, fragmentation and repetition. With the advances in the field of information technology, digital resources have been rapidly assimilated into many different sectors of human life. Artistic creation has not been immune to these changes. In the field of printmaking a range of possibilities is opening up with the combination of new resources and the archaic founding gesture of the mark and the print. Here, we discuss aspects of the practice of printmaking in contemporary times, the incorporation of new resources to traditional procedures and the various manifestations of the marking and printing processes that characterize printmaking and can also be seen in other forms of artistic production.